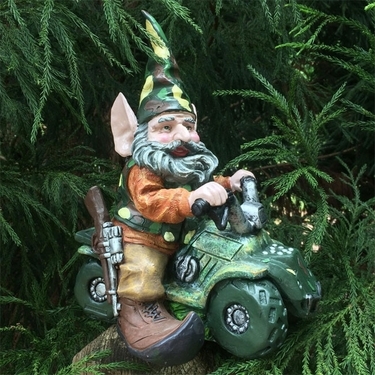 From our Premium collection, our Amazing New Hunter Gnome Riding on ATV is one of the nicest gnomes we've every carried. Incredible detail, this figurine is a work of art for the most discriminating gnome collector. Born to Ride his All Terrain Vehicle, protect his 2nd Amendment rights, and keep that animal popular in check, this Camo wearing Hunting gnome with Rifle and scope will blend into any sportsman's garden or collector display case!